The use of resuscitation fluids has been emphasized that if blood pressure is raised rapidly before the hemorrhage has been definitely controlled, increased bleeding may occur. Persistent infusion of large volumes of fluids in an attempt to achieve a normal blood pressure is not a substitute for definitive control of bleeding. In penetrating trauma with hemorrhage, delaying aggressive fluid resuscitation until definitive control may prevent additional bleeding. Acute cardiac tamponade due to trauma is best managed by thoracotomy. A patient sustaining a penetrating wound, who has required CPR should be evaluated for any signs of life. If there are none and no cardiac electrical activity is present, no further resuscitative effort should be made. Intraabdominal sources of hemorrhage must be excluded or treated operatively. O = opsthion (posterior margin of foramen magnum). 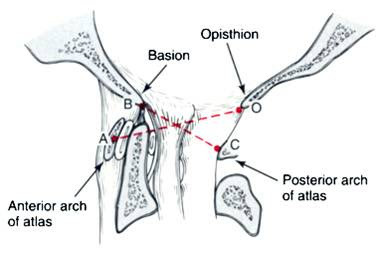 If BC/AO greater than 1, anterior occipitoatlantal dislocation exists.